Prérequis: L’inflammation a été impliquée dans la progression et la dissémination du cancer broncho-pulmonaire et parmi ces marqueurs de l’inflammation la c réactive protéine (CRP) et le neutrophil to lymphocyte ratio (NLR) sont des marqueurs pronostiques dans le cancer broncho-pulmonaire non à petites cellules (CBPNPC). Le but de notre travail est d’étudier l’apport de ces deux marqueurs combinés dans l’optimisation de la prédiction pronostique dans le CBPNPC aux stades avancés. Méthodes : Nous avons mené une étude rétrospective qui a inclus tous les patients hospitalisés dans notre service entre janvier 2005 et janvier 2013 et ayant un cancer broncho-pulmonaire non à petites cellules (CBPNPC) stade IIIb et IV. Résultats : Cent quarante-deux patients de sexe masculin sont inclus. La plupart (80,3%) ont un PS évalué à 0-1. La médiane de survie sans progression et de survie globale sont respectivement de 4,6 mois (Intervalle de confiance IC à 95% 3,9-5,3) et 8,9 mois(IC à 95% 7,7-10,1). L’analyse multivariée montre qu’une CRP< 10 mg/l et un NLR<3,87 sont des facteurs de meilleur pronostic (p=0,015 et 0,049) en plus de l’administration de la chimiothérapie (p<0,0001), du PS <2 (p=0,009) et de l’âge<65 ans (p=0,013). De plus, l’utilisation combinée de la CRP et du NLR est significativement associée à la survie (p=0,0009). La médiane de survie des patients ayant la CRP et le NLR élevés est de 6,7 mois, et est significativement inférieure en cas d’élévation d’un seul marqueur (CPR ou NLR) (8,8 mois; p=0,025). Conclusions: Une CRP et un NLR élevés (respectivement ≥10mg/l et ≥3,87) sont associés à une mauvaise survie dans le CBPNPC aux stades avancés. Leur utilisation combinée optimise leur valeur pronostique. Lung cancer is the most common cancer in the male population worldwide (1). It is also the deadliest, with a five-year survival rate estimated to 18.4% in the United States in 2011 (2). Non-small-cell lung cancer (NSCLC) is the most common histological type (3). Although it can benefit from a radical surgical treatment, most of the cases are diagnosed in locally advanced or metastatic stages and are consequently inoperable (2). Improving the poor prognosis of NSCLC involves the development of new drugs and the enhancement of therapeutic strategies. Advances in tumor profiling have led to the conception of biologically targeted therapies. Therefore, an accurate assessment of patients' survival chances and their response to personalized therapies is essential. Several studies are now attempting to refine NSCLC prognostication by integrating clinical or biomolecular criteria into predictive models of survival. Blood biomarkers are interesting candidates because of their good availability and reasonable cost. Inflammation has been implicated in the pathogenesis of neoplastic disease including lung cancer (4, 5). It has also been incriminated in cancer progression and dissemination (6, 7). The magnitude of the systemic inflammatory response appears to correlate reliably with the decline of functional and nutritional status, response to treatment and survival. In particular, inflammation markers such as C-reactive protein (CRP) and Neutrophil to Lymphocyte Ratio (NLR) have been investigated. However, little studies have assessed the combined use of these two markers in optimizing prognostication. The aim of our study was to determine the role of NLR and CRP, as well as their combined use in predicting the prognosis of advanced NSCLC. We conducted a retrospective study that included all patients with advanced NSCLC (inoperable stage IIIB and IV) admitted to the respiratory department II of Abdurrahman MamiHospital between January 2005 and January 2013. Exclusion criteria were all conditions that may affect the blood count or the CRP level such as autoimmune or hematological disease, immunosuppressive therapy or antibiotics upon baseline laboratory measurements and malignant tumor during the five years prior to NSCLC diagnosis. Data were collected from medical records. TNM stage classification was done according to the 7th TNM edition. Age, medical history, Performance Status (PS) according to the Eastern Cooperative Oncology Group scores, Body Mass Index (BMI), tumor size, histology type, and chemotherapy regimens were recorded. Baseline CRP and NLR were taken from the first laboratory tests performed. The NLR was calculated from the blood count as the ratio neutrophile/lymphocyte. Data were analyzed using R software Version 3.2.2. Non-parametric Mann-Whitney-u test and Kruskal-Wallis test were used when appropriate to compare medians of two or more groups. Spearman's rho correlation was used to correlate two continuous variables. Kaplan-Meier method was used to estimate the probability functions of PFS and OS. Log-rank test was used to compare the survival curves within various prognostic factors. The cut-off value of CRP was set as 10mg/l which was the most frequently used in the literature. Otherwise, a receiver operating characteristic (ROC) curve using six-month survival events was constructed to set the optimal cut-off value of the NLR. Factors having a p value ≤ 0.15 were included in a multivariate Cox regression model in order to estimate the adjusted hazard ratios (HR) for each prognostic factor. Significance level of p value was set to 0.05 for all statistical tests. A total of 142 patients were included in the study. All patients were male due to the recruitment system of our department. Patients' characteristics are summarized in Table 1. Mean age of our patients was 60 ±10,017years with elderly patients (≥ 65 years) representing 35.2%. Smoking history was found in 95% of the cases, with a median consumption of 43 pack-years (P-Y) (ranging from 2 to 150 P-Y). Most patients (80.3%) had a good PS (0 or 1) upon admission. Patients with stage IV NSCLC represented 76% of our sample. Adenocarcinoma was the most common histological type (50.7%) followed by squamous-cell carcinoma (25.4%), while other histological types (large-cell carcinoma, sarcomatoid carcinoma etc.) accounted for only 4.2% of the cases. High baseline CRP (≥ 10mg/L) was found in most patients (80.1%) with a median value of 47.9 mg/L (ranging from 0.58 to 387.98mg/L). The optimal NLR value for predicting six-month survival was 3.87 with 53.8% sensitivity and 72.4% specificity on the ROC curve. High baseline NLR values (≥ 3.87) were noted in 39.4% of the cases (Table 1). 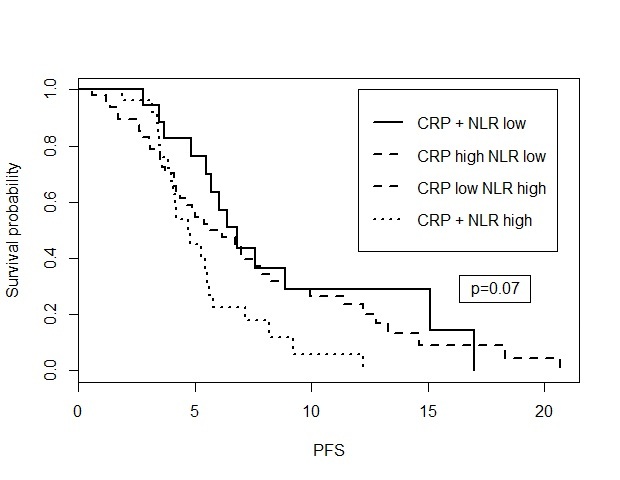 Sixty-six patients (46.5%) had at least one elevated prognostic marker while 55 patients (38.7%) presented with both high CRP and NLR. Median PFS was 4.6 months (95% CI = 3.9 - 5.3) with extremes ranging from 0.6 months to 20.7 months. The likelihood of PFS at 3 months and at 6 months was respectively 77% and 36%. Median OS was 8.9 months (95% CI = 7.7 - 10.1) and ranged from 0.5 months to 37.2 months. The probability of a six-month OS and a one-year OS was estimated respectively to 67% and 37%. Compared to patients with low NLR, patients with high NLR (≥ 3.87) had significantly more metastasis sites (p=0.028) and were less likely to receive chemotherapy (p=0.012) (Table 2). Similarly, patients with high CRP had less chance of receiving chemotherapy (p=0.001) but had also a history of higher tobacco consumption in P-Y (p=0.04), a lower BMI (p<0.0001) and a larger tumor size (p=0.039). Univariate analysis of survival showed that NLR and CRP were both significantly associated with OS (p value respectively at 0.009 and 0.002). Only NLR was significantly associated with PFS (p=0.013) (Table 3). 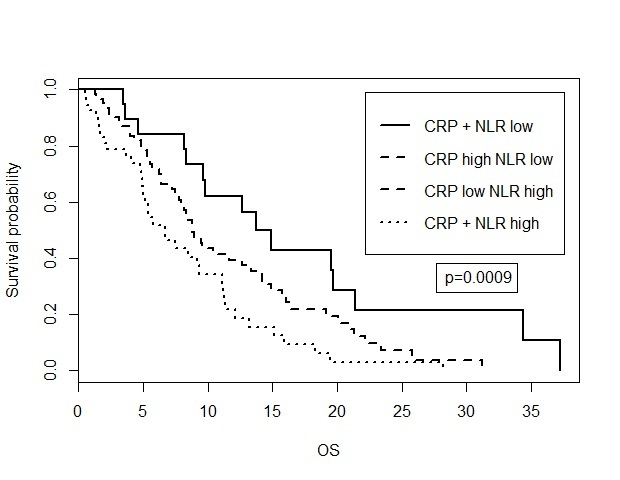 In addition, combined use of NLR and CRP was significantly associated with OS (p=0.0009) (Figure 1). It was also more informative than their separate use. In fact, median OS for patients having both high NLR and CRP was 6.7 months. It was significantly shorter than patients having only one elevated inflammatory marker (CRP or NLR) (8.8 months; p=0.025). However, the combined use of NLR and CRP did not show any further contribution in terms of PFS (Figure 2). 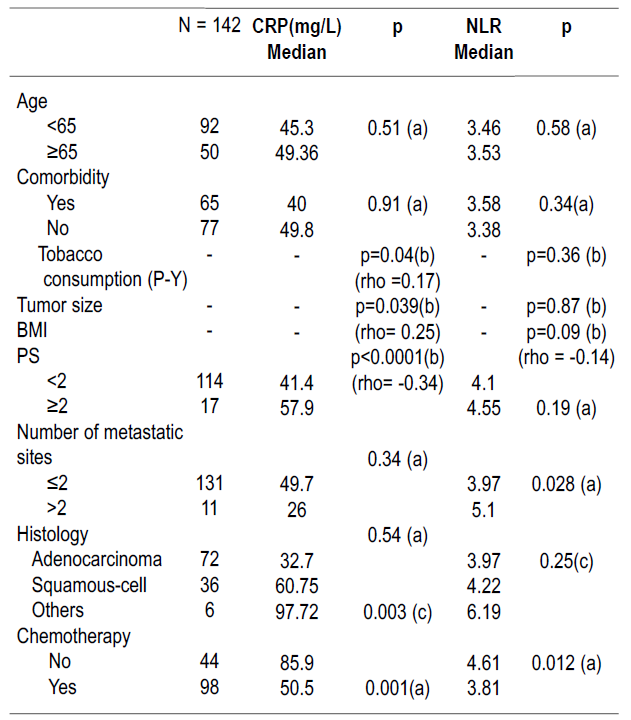 Other prognostic factors found significant for OS were PS≥2 (p=0.04), age≥65 (p=0.02), histology subtypes other than adenocarcinoma (p=0.008) and the non-use of chemotherapy (p<0.0001). In addition to high NLR, other factors associated significantly with PFS were tobacco consumption history ≥ 43 PY (p=0.041) and the presence of more than two metastatic sites (p=0.007). 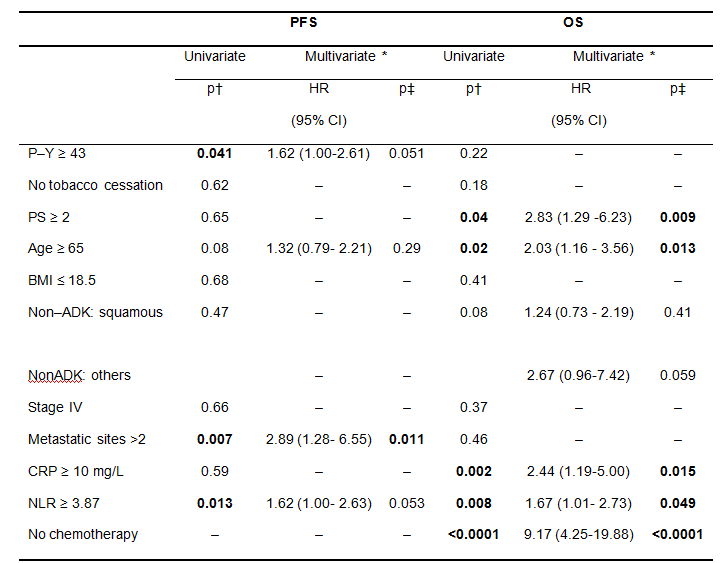 Multivariate analysis found that independent prognostic factors for OS were absence of chemotherapy use (HR= 9.17; p <0.0001), PS ≥ 2 (HR= 2.83; p=0.009) and age ≥ 65 (HR= 2.03; p = 0.013) as well both of CRP≥ 10mg/L (HR= 2.44; p=0.015) and NLR ≥ 3.87 (HR= 1.67; p=0.049) (Table 3). However, only a number of metastatic sites greater than two was an independent predictor of PFS (HR=2.89; p=0.011). Our study showed that both pretherapeutic CRP and NLR were useful biomarkers for predicting prognosis in advanced NSCLC and their combined use holds greater value in prognostication in advanced NSCLC. In recent years, numerous studies have examined the prognostic value of the systemic inflammatory response during cancer, particularly through investigating CRP and NLR. CRP has been established as a prognostic indicator in a variety of cancers, including NSCLC (8). The cut-off value of 10 mg/l that we choose in our study has been used by many other authors and adopted in scores such as the Glasgow Prognostic Score (GPS) (9-12). Jing et al. reviewed eight studies examining the prognostic value of CRP in NSCLC and found that elevated plasma CRP levels might predict poor 5-year OS rates (HR=2.15; 95% CI: 1.78-2.59) (13). The mechanisms underpinning the prognostic implication of CRP during cancer seem to be diverse and not completelyelucidated. CRP is exclusively produced by hepatocytes upon stimulation by circulating pro-inflammatory cytokines, in particular interleukin-1 (IL-1), Tumor Necrosis Factor, and particularly IL-6 (14). As supported by experimental studies, high CRP levels during NSCLC could be explained by an increased production of inflammatory cytokines prompted by neoplastic cells (15). Indeed, in a meta-analysis conducted by Liao et al., the authors assessed the prognostic impact of several circulating inflammatory mediators in patients with NSCLC and found that CRP and IL-6 were both associated with a shortened OS (16). In a work comprising 2910 patients with invasive breast cancer, high CRP levels at diagnosis were associated with a larger tumor size, a less differentiated histological grade and a poor prognosis (17). Similar findings were reported for unresectable NSCLC (18). Indeed, our results found that high CRP levels correlated significantly with a larger tumor size and a lower BMI as well as a poor OS. Previous studies undertaken on lung cancer showed that the presence of a systemic inflammatory response was associated with increased resting energy expenditure, low BMI and a shortened survival (19). The plasma half-life of CRP is constant in all situations and is not influenced by any other physiological or pathological condition. Thus, blood levels of CRP reflect solely the magnitude of tissue inflammation (20). However, CRP is not a specific marker of cancer. Despite the fact that infectious etiologies of elevated CRP during cancer could be easily ascertained and taken into consideration, high CRP levels could also result from other factors that might be less obvious to adjust for. For instance, chronic obstructive pulmonary disease and cardiovascular diseases have all been reported to impact on circulating CRP levels (21, 22). Therefore, several studies took interest in other inflammation markers (23). Some authors were initially interested in NLR (23). In a meta-analysis, Gu et al. combined the results of 3656 NSCLC patients from 14 individual studies and demonstrated that a high pretreatment NLR was significantly associated with a poor OS (HR: 1.70; 95% CI: 1.39-2.09) and a short PFS (HR: 1.63; 95% CI: 1.27-2.9) (23). These combined HRs reported respectively for OS and PFS are very comparable with the HRs found in our study. Gu et al. concluded that despite the heterogeneity of the studies, the prognostic significance of NLR was similar across different countries of studies, sample sizes, tumor stages, treatment strategies, and cut-off values chosen by each study. They also stated that a dichotomous value of 5 for NLR could provide the best cut-off value to guide clinical decision and predict treatment outcomes in western patients with NSCLC. For our North-African patients, we opted instead for 3.87 as a cut-off value because it had the best sensitivity to specificity ratio on the ROC curve. A high NLR implies an increased number of neutrophils and/or a decreased lymphocyte count with a relative lymphopenia. During neoplastic diseases, leucocytes play the role of a double-edged sword in tumor progression (24). It was argued that a specific cytokine secretion profile supported by cancerous cells might be responsible for directing neutrophils towards an aberrant way of tumor stimulation (25). Indeed, although Tumor Associated Neutrophils (TAN) are normally agents of anti-tumor defense, neoplastic cells can induce a TAN phenotype that promotes angiogenesis in the tumor microenvironment (26, 27). In addition to these in-situ neutrophils, circulating neutrophils could also promote metastasis by tumor cells trapped within neutrophil extracellular traps (NETs) (28). These observations might explain the significant association that we found in our study between NLR and the number of metastatic sites. On the other hand, lymphocytes have a major role in anti-tumor immunity by inhibiting the proliferation and migration of tumor cells (7, 29, 30). Excess neutrophils have been implicated in the suppression of the cytolyticactivity of lymphocytes and Natural Killer cells, and inhibition of T cell proliferation (31). This may partly explain the association of a high NLR with a shortened survival. NLR might reflect the imbalance of the host's inflammatory response between pro-tumor activity and anti-tumor agents. In our study, it was of interest to note that NLR and CRP were independent factors of OS in the multivariate model. We might theorize that even though NLR and CRP are both inflammation markers, the mechanisms underlying their prognostic significance are different. Therefore, the combined use of these two markers could be of a great interest. Many scores have combined inflammation markers to maximize their prognostic value. For example, the GPS is a score which combined a positive inflammation marker (CRP) to a negative inflammation marker (serum albumin) (32). Other scores have incorporated inflammation markers with other clinical or biological parameters (33). The prognostic index (PI) is a score that combines white blood cell count (WBC) with CRP (34). In a study comprising 134 patients, Kasymjanova et al. showed that the PI was significantly associated with PFS and was an independent indicator of OS (34). A normal WBC could nonetheless mask an elevated NLR. We might therefore suggest that NLR could be more reliable than WBC in reflecting the maladjusted inflammatory response we discussed earlier. In a study including 301 patients with resected NSCLC, Tomita et al. examined the combined use of preoperative CRP and NLR and concluded that it was an independent prognostic factor (35). Our present work revealed similar findings for advanced NSCLC. This study has some limits due to its retrospective nature. Data regarding therapy received prior to admission (corticosteroids and antibiotics) were missing in some cases. Another limit lies in the variety of cut-off values found in the literature for both CRP and NLR. This might be unpractical when making treatment decisions and raises the question about the optimal dichotomous value to choose. Besides, these cut-off values can only divide patients into two groups whereas, in reality, patients presenting slight elevation of inflammation markers should not be regarded as having the same prognosis as those with patently high levels. Therefore, the main advantage of combining CRP with NLR lies in the dichotomization of patients into three groups rather than two, which makes patients with only one elevated inflammation marker fall into an intermediate-risk group. We found that both baseline NLR and CRP were a prognostic factors for OS in advanced NSCLC. Their combination offered an additional input for refining prognostication in patients with advanced NSCLC. Since these two markers have a low cost and a good availability, their combined use should be taken into consideration to guide treatment decisions. Ferlay J1, Soerjomataram I, Dikshit R, Eser S, Mathers C, Rebelo M et al. Cancer incidence and mortality worldwide: sources, methods and major patterns in GLOBOCAN 2012.Int J Cancer. 2015;136(5):E359-86. Ries LAG. Influence of extent of disease, histology, and demographic factors on lung cancer survival in the seer population-based data. SeminSurg Onco1994;10(1):21-30. Lortet-Tieulent J, Soerjomataram I, Ferlay J, Rutherford M, Weiderpass E, Bray F.International trends in lung cancer incidence by histological subtype: Adenocarcinoma stabilizing in men but still increasing in women. Lung Cancer 2014;84(1):13-22. Aggarwal BB, Shishodia S, Sandur SK, Pandey MK, Sethi G. Inflammation and cancer: How hot is the link? BiochemPharmacol 2006;72(11):1605-21. Shiels MS, Pfeiffer RM, Hildesheim A, Engels EA, Kemp TJ, Park JH,et al. Circulating inflammation markers and prospective Risk for lung Cancer. J Natl Cancer Inst 2013;105(24):1871-80. Fridman WH, Pagès F, Sautès-Fridman C, Galon J. The immune contexture in human tumours: impact on clinical outcome. Nat Rev Cancer 2012;12(4):298-306. Mantovani A, Allavena P, Sica A, Balkwill F. Cancer-related inflammation. Nature 2008;454(7203):436-44. Roxburgh CSD, McMillan DC.Role of systemic inflammatory response in predicting survival in patients with primary operable cancer. Future OncolLondEngl 2010;6(1):149-63. Fiala O, Pesek M, Finek J, Topolcan O, Racek J, Minarik Met al. High serum level of C-reactive protein is associated with worse outcome of patients with advanced-stage NSCLC treated with erlotinib. Tumor Biol 2015;36(12):9215-22. O’Dowd C, McRae LA, McMillan DC, Kirk A, Milroy R. Elevated preoperative C-reactive protein predicts poor cancer specific survival in patients undergoing resection for non-small cell lung cancer. J ThoracOncol 2010;5(7):988-92. Koch A, Fohlin H, Sörenson S. Prognostic significance of C-reactive protein and smoking in patients with advanced non-small cell lung cancer treated with first-line palliative chemotherapy. J ThoracOncol 2009;4(3):326-32. McMillan DC. The systemic inflammation-based Glasgow Prognostic Score: A decade of experience in patients with cancer. Cancer Treat Rev 2013;39(5):534-40. 13. Jing X, Huang C, Zhou H, Li C, Fan L, Chen J et al. Association between serum C-reactive protein value and prognosis of patients with non-small cell lung cancer: a meta-analysis. Int JClinExp Med 2015;8(7):10633. McKeown DJ, Brown DJF, Kelly A, Wallace AM, McMillan DC. The relationship between circulating concentrations of C-reactive protein, inflammatory cytokines and cytokine receptors in patients with non-small-cell lung cancer. Br J Cancer 2004;91(12):1993-5. Haura EB, Livingston S, Coppola D. Autocrine Interleukin-6/Interleukin-6 Receptor stimulation in Non–Small-Cell Lung Cancer. Clin Lung Cancer 2006;7(4):273-5. Liao C, Yu Z, Guo W, Li C, Fan L, Chen Jet al. Prognostic value of circulating inflammatory factors in non-small cell lung cancer: a systematic review and meta-analysis. Cancer Biomark 2014;14(6):469-81. Allin KH, Nordestgaard BG, Flyger H, Bojesen SE. Elevated pre-treatment levels of plasma C-reactive protein are associated with poor prognosis after breast cancer: a cohort study. Breast Cancer Res 2011;13(3):55. Lee JG, Cho BC, Bae MK, Lee CY, Park IK, Kim DJ et al. Preoperative C-reactive protein levels are associated with tumor size and lymphovascular invasion in resected non-small cell lung cancer. Lung Cancer 2009;63(1):106-10. Scott HR, McMillan DC, Forrest LM, Brown DJF, McArdle CS, Milroy R. The systemic inflammatory response, weight loss, performance status and survival in patients with inoperable non-small cell lung cancer. Br J Cancer 2002;87(3):264-7. Vigushin DM, Pepys MB, Hawkins PN. Metabolic and scintigraphic studies of radioiodinated human C-reactive protein in health and disease. J Clin Invest 1993;91(4):1351-7. Zhang Y, Bunjhoo H, Xiong W, Xu Y, Yang D. Association between C-Reactive Protein Concentration and Chronic Obstructive Pulmonary Disease: A Systematic Reviewand Meta-Analysis. J Int Med Res 2012;40(5):1629-35. Halcox JP, Roy C, Tubach F, Banegas JR, Dallongeville J, De Backer G et al. C-reactive protein levels in patients at cardiovascular risk: EURIKA study. BMCCardiovascDisord 2014;14:25. Gu X-B, Tian T, Tian X-J, Zhang X-J. Prognostic significance of neutrophil-to-lymphocyte ratio in non-small cell lung cancer: a meta-analysis. Sci Rep 2015; 5:12493. Pollard JW. Tumour-educated macrophages promote tumour progression and metastasis. Nat Rev Cancer 2004;4(1):71-8. Granot Z, Jablonska J. Distinct Functions of Neutrophil in Cancer and Its Regulation. Mediators Inflamm 2015;2015:701067. Fridlender ZG, Sun J, Kim S, Kapoor V, Cheng G, Ling L et al. Polarization of Tumor-Associated Neutrophil (TAN) phenotype by TGF-β: “N1” versus “N2” TAN. Cancer Cell 2009;16(3):183-194. Jablonska J, Wu C-F, Andzinski L, Leschner S, Weiss S. CXCR2-mediated tumor-associated neutrophil recruitment is regulated by IFN-β. Int J Cancer 2014;134(6):1346-58. Cools-Lartigue J, Spicer J, McDonald B, Gowing S, Chow S, Giannias B et al. Neutrophil extracellular traps sequester circulating tumor cells and promote metastasis. J Clin Invest 2013;123(8):3446-58. Nakano O, Sato M, Naito Y, Suzuki K, Orikasa S, Aizawa M et al. Proliferative Activity of intratumoral CD8+ T-Lymphocytes as a Prognostic Factor in Human Renal Cell Carcinoma clinicopathologic demonstration of antitumor immunity. Cancer Res 2001;61(13):5132-6. Braumüller H, Wieder T, Brenner E, et al. T-helper-1-cell cytokines drive cancer into senescence. Nature 2013;494(7437):361-5. Pillay J, Kamp VM, Van Hoffen E, Visser T, Tak T, Lammers JW et al. A subset of neutrophils in human systemic inflammation inhibits T cell responses through Mac-1. J Clin Invest 2012;122(1):327-36. Watt DG, Roxburgh CS, White M, Chan JZ, Horgan PG, McMillan DC. A Survey of attitudes towards the Clinical Application of Systemic Inflammation Based Prognostic Scores in Cancer. Mediators Inflamm 2015;2015:1-7. Gagnon B, Agulnik JS, Gioulbasanis I, Kasymjanova G, Morris D, MacDonald N. Montreal prognostic score: estimating survival of patients with non-small cell lung cancer using clinical biomarkers. Br J Cancer 2013;109(8):2066-71. Kasymjanova G, MacDonald N, Agulnik JS,Cohen V, Pepe C, Kreisman H et al. The predictive value of pre-treatment inflammatory markers in advanced non-small-cell lung cancer. CurrOncol 2010;17(4):52-8. Tomita M, Shimizu T, Ayabe T, Onitsuka T. Elevated preoperative inflammatory markers based on neutrophil-to-lymphocyte ratio and C-reactive protein predict poor survival in resected non-small cell lung cancer. Anticancer Res 2012;32(8):3535-8.